eat, drink & be vegan: My Amy's Goodies... and a Giveaway! My Amy's Goodies... and a Giveaway! We've always been big fans of the Amy's line of products. When we first turned vegan, oh-so-many years ago, it was Amy's that offered the first storebought options for us. The Roasted Vegetable Pizza was one of the first items available in our stores, along with California Burgers. Their Veggie Loaf took me through a good portion of my second pregnancy (and I still like it! ), and now the Baked Beans and Alphabet Soup are absolute favorites with our kids. Amy's T-shirt (blue) and Tote bag! While we don't have access to the full range of products here in Canada, I love to see the new items Amy's has developed in response to the changing demands of vegan and vegetarian consumers, such as their Single Serve Non-Dairy Rice Crust Cheeze Pizza, and the new Sonoma Veggie Burgers (quinoa-based)! So, when Amy's offered to send me some goodies, needless to say I was tickled pink! I received some product coupons, a t-shirt and tote bag (both of which I love, wear, and use) and some other neat treats including these... coolest... magnets... EVER. Okay, our girls giggled silly when they saw these magnets, and I think they are the most fun a fridge door can have! I like their spinach feta pocket and their veggie loaf whole meal. I'm a sucker for comfort foods: the roasted veggie pizza and the mac & cheese are my favorites! I love Amy's stuff too. It's hard to pick just 2, but I will try. I really love the Indian TV dinners and the california veggie burgers. The Sonoma Burger and the veggie/ABC soup are this household's favorites!! My favourite Amy's products are the Black Bean Enchilada meal and No Chicken Noodle Soup. I have a deep fondness for the non-dairy burrito (it has certainly helped me out in a pinch, many times!) and the enchilada meal. For frozen food, it's pretty good stuff! our two favourite Amy's products are the California Burgers and the Black Bean & Vegetable Burritos. My favorites are the tofu scramble and the black bean tamales with tomatillo salsa, although the veggie loaf is a close third! Big sad face :-( I've never tried any of Amy's products. Feel like I've missed out on something here. Mattar Tofu and Veggie loaf are two of my favorite lunches! Amy's is the best! I enjoy their Baked Ziti Kid's Meal (great for adults too! ), and the vegan mac and cheese. Mattar tofu and veggie loaf make great lunches! I love the soups and the mac and cheese yummy. I love the black bean burritos and the chocolate bunny grahams! I like her vegan mexican entrees like the black bean enchiladas and tamales. Also like the vegetable korma. in a pinch i love the roasted veggie pizza and the chili with vegetables! I've only been vegan since October and have never tried any of Amy's products! I love Amy's Mac and Cheese and Enchiladas! yummy rice and bean burritos and that orange cake is TDF!!! I like the veggie burgers (all of them) and the enchiladas. Yum! I love the roasted vegetable pizza and the black bean soup! Love the pizza's and soups! Oh, I LOVE Amy's! They make life so much easier. My favorites are the gluten-free mac & cheese and the roasted veggie pizza. Yum, now I'm hungry! Hmm, I like all their vegan items! If I HAD to chose I would pick the tofu scramble in a pocket and the dairy free macaroni & cheeze. Yummy!! I loooove Amy's burritos. And of course, Mac and Cheese. It's hard to just pick 2 foods! I love all of Amy's vegan foods! If I HAD to make a choice I would pick the tofu scramble in a pocket sandwich and the non-dairy macaroni cheeze. YUMMY!!! Ooh I LOVE Amy's! The roasted vegetable pizza is amazing, and I also love the light in sodium spicy chili. I love the roasted veggie pizza and the enchiladas! The rice mac and cheeze saved my life when I was forced to go gluten free! I also love the Indian meals, they are so full of flavor! The roasted vegetable no cheese pizza is my #1 favorite. Hard to pick my #2... My son loves the burritos, so let's say the non-dairy burrito! Tough choice but I love their pizza and vegetable soup! I LOVE the rice mac & chesse and the rice crust roasted veggie pizza. So thankful for the gluten free items!!! i love the roasted veggie pizza too! unfortunately, that's the only amy's i've tried so far.... so i'd LOVE to win this giveaway!!! Oh gosh, we are HUGE Amy's fans! My favorites are their Roasted Veggie Pizza and I buy a can of their Refried Black Beans every week!! The sonoma burgers & the non dairy mac n cheese. I love the black soup and the mac and cheese! I love the veggie loaf meal and ALL of their vegan soups. Yum! I love Amy's products! Just had a pot pie for lunch. It'd be hard to narrow it down to two faves - off the top of my head, the alphabet soup, black bean burrito, the bowl meal with black eyed peas and rice, the no-chicken noodle soup, any enchilada or tamale meal. i love the roasted vegetable pizza and black bean soup! yum! would love to score some amy's swag. thanks for the giveaway! I have never tried Amy's but I will now. Actually this is the first time I have even heard of their products. Thank you for sharing! As for my favorites, I think I would love the Spinach Lasagna and Lemon Poppy Seed cake. Oh it's so hard to choose... but if I had to, I'd say their vegan mac & cheese and their Vegetable Korma! I love Amy's products too! I'm a big fan of the veggie loaf and the vegan cheese, rice crust spinach frozen pizza. Mmmmmmm, Amy's! I love the pizzas and the burritos. Reminds me, I have some freezer stocking to do. The bowl items looks so fabulous especially the Ravioli bowl and the stuffed shell bowl. Oooh, I'm gonna have to go with the california veggie burger and the roasted vegetable pizza. Oh boy, mission accomplished on your part...I'm developing mad amy's pizza cravings! Must be time for second lunch. I really like their low sodium lentil soup and non-dairy pot pies. They kept me going when I was going for my master's. I really like their spinach and tofu wrap and their three bean and pasta soup, but as I was looking at the website, I realized that there's so much more that I want to try one day! I love the roasted veggie pizza and black bean soup.Fun!! Awesome giveaway! I love the vegan burritos and a couple of the different veggie burgers. Love Amy's. The mac and cheese is delicious, so is the spinach feta pocket. Yummy! How nice it is to have a give away! I honestly haven't tried their stuff, but was just looking at their rice cheese pizza last night! It looked yummy! Someday I'd like to try their spicy vegan chili and possibly one of those vegan indian dinners! My whole family loves the cheese free pizza even more than regular pizza and the burritos are great to grab in a rush. This is a tough call! I love the cheeseless roasted veggie pizza, so that's high on the list. I'm sick right now and just tried the chickenless noodle soup and thought it was really good as well. I want to pick more but I'll stop at two :). I love their roasted vegetable pizza and orange cake. I want magnets! My favorites are the Spinach pizza and the lentil vegetable soup. I love the california burgers and the minestrone soup!! ooo I love all of Amys products but the Black bean Burritos and the Roasted Veg Pizza are two household favorites! My favorites are the Black Bean Burritos and the Lentil Vegetable soup :) Amy's is wonderful! I like everything I've ever had of Amy's, but I particularly love those cakes and their roasted veggie pizza. Amy's saves the day very often in our household for my two year old - the Non-Dairy Rice Mac and Cheese and Soy Cheese PIzza! We like the roasted veg pizza too, and also the black bean enchiladas. fire roasted veggie pizza!! and the re fried beans are a staple in our house! I just had the Black Bean soup for lunch today! I also love their Black Bean Vegetable Enchilada, so yum and so convenient for work. I also really like Amy's veggie pizza, the one with the caramelized onions and artichokes on top. I love the Organic Lentil Soup (awesome protein-y lunch) and the frozen Bean Burritos. We love Amy's veggie loaf and her dairy free Mexican burrito with beans and rice. Yum! The soups are totally my favorite - Lentil and Southwest Veggie are the BEST! Amy's is the best! I love all of the frozen meals, but especially the tamales and the black-eyed pea bowl! Thank goodness for Amy's stuff! My two favorites? Probably her vegan burritos and lentil soup! Lots of amazing. So hard to pick just 2 when I love them all.. I'll have to go with the Non-Dairy Burrito and the Tofu Scramble Pocket! California Veggie Burgers and the beans! Same thoughts as yourself, my selection is non-existent in my home town, stock up on goodies when travelling for the kiddies! My favorite is her bowls!!! The teriyaki one and black eyed peas ones are aaaaa-mazing! OH it is the new mac and cheese made with daiya cheese! seriously good stuff!! I mostly just eat their burritos, but I'd love a goody pack. Favourites over here would have to be the Roasted Veggie Pizza and the Alphabet Soup (lovingly referred to as 'letter soup' by my hooligans). Not so original, but definitely the faves! Fingers crossed for a teeny tiny magnet of my own! I love Amy's Non Dairy Burrito and Low-Fat Black Bean Soup. I actually had one of those burritos for lunch today! I don't have a favorite yet because this is only my households second week of being Vegan. We have seen it at our local coop and are looking forward to exploring their product and finding favorites. My favourite will always be the vegan roasted veg. pizza....but I would have to say, I tried the vegan/gluten free mac & cheese at CHFA East last October, and I almost CRIED, it was so good. I love the Black-eyed pea and rice bowl and the shepard's pie "potpie." It was hard to pick just two favorite's though! i love the daiya mac n cheese and the lentil soup. I love the Black bean soup! butternut squash soup, any indian dinner! Yum - roasted veggie pizza and tomato soup! My mouth is watering!! Scrambled tofu and roasted veggie tamale! i love the veggie loaf and the frozen burritos! all of it is soo good though! The veggie loaf but I love the pasta sauces! SOOOO yummy!! Um... EASY The Roasted Vegetable Pizza and the new Mac N Cheez with Daiya! OMG YUMMERSS! (LOVE that pizza!!!) Thanks for sharin the Amy's love! I love Amy's refried black beans and the vegetable pot pie!! My favorites are the terriyaki burrito and Lentil soup. I like the roasted veggie pizza and bean burrito especial. They are both especially good! I love their nondairy burritos and pizzas.I've wanted to try more of their items though! <3 Amy's! I'm so addicted to their Veggie Loaf! I love the enchiladas too! The "chicken" noodle soup is my favorite thing to eat when I am sick! I also love the vegan mac and cheese. I like the vegan pizza and the california burgers! Baked beans on toast would not be the same with out Amy's. And the second one would have to be Amy's chili, perfect on baked potato! Tofu Scramble in a Pocket Sandwich & Shepherd's Pie! Yum! I love the Roasted Veggie Pizza, and the Bistro Burgers!!! love shepherd's pie and tamale pie! I'd have to go with Amy's black bean chili and Indian Samosa Wrap! I think the Indian dishes have to be my faves! They kept me sane during morning sickness if you can believe it!! The Veggie Loaf was a pregnancy staple for me through my last pregnancy and this one. One of the few things I could eat when so, so nauseous!!! And the California burgers are one of the few meals that make all five soon to be six of us happy!!! Oh my goodness, best giveaway yet! I love their products, and see so many online we don't have in Canada. I'd have to say the California burgers and the Dairy Free Macaroni and Cheeze! Had to order that online :) Those Quinoa burgers look sooo good! I love her Low Sodium Mac & Cheese and her Low Sodium Mexican Casserole bowl! I just had the mac & cheese for dinner two nights ago... it's a great quick healthy meal... yum! It's hard to pick just 2, but I think I would have to say the No Chicken Noodle soup and the Samosa Wrap! I love them all! But lately I've been really digging the dairy-free rice and bean burrito and the veggie loaf meal! Mac and CheeZe and medium salsa! Yum!!! 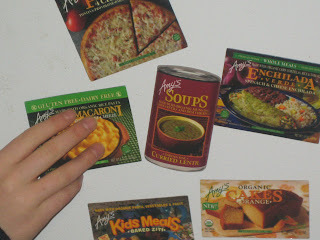 I love Amy's products and have been dying to try the Sonoma burger: ) My current two fave Amy's products are the alphabet vegetable soup and their vegan pizzas: ) Delish! Oh and I love the All-American veggie burger too. Hmmm Maybe... noo... only two?! I have a major obsession with Veggie Loaf meal. I eat it almost twice a week. The cheese-less pizza is awesome too. I love the roasted veggie pizza and the non-dairy bean burrito! Her burritos inspired me to make my own for my kids lunches! I love Amy's burritos and roasted veggie pizza. But I'm super-excited to try their new vegan pizza with Daiya cheese! The veagn mac n cheese is my current addiction. I can't get enough of it! I also like the vegan pizza as a snack. The Breakfast Burrito and the Grilled Veggie vegan pizza. Yummy stuff. So hard to choose just two! I love the no-chicken noodle soup and the burritos! I love the Quarter Pound Veggie Burger for a healthy dose of protein (but only 200 calories!) and life would be incomplete without the Rice Macaroni and Cheeze to warm my tummy on a cold day. Even my carnivorous co-workers salivate over the Rice Mac & Cheeze when it comes out of the microwave! I love, love, LOVE Amy's line. The unchicken noodle soup has gotten me through a lot of tough times and the veggie loaf meal is so comforting! Black Bean Soup and California veggie burgers! I love their split pea soup and the california veggie burgers! amy's pizzas are a staple go-to when you just don't have time/energy to cook. amy's mac and cheese is sooooo yummy and comforting. I LOVE the Roasted Veggie Pizza. My Husband and I always keep our freezer stocked with a few of 'em for those nights we're feeling too lazy to cook. A close second is the Sanoma Burgers, oh so tasty and I love that they're gluten free! I love the enchiladas and roasted veg pizza! I haven't tried too many of Amy's goodies... but I do remember trying the pot pie and also the canned chili. I lo0o0ove the roasted veggie pizza and their low fat chili! Love them all, but the grilled vegetable pizza and the new mac & cheese with Daiya are my favorites! Can I pick the chili twice? It is that good! I love Amy's bean burritos and their roasted veggie pizzas. It's so nice to have frozen vegan food! The baked ziti bowl and the mac and cheeze! I love their Rice crust,soy cheese pizza. And my new fav is the Gluten free non dairy mac n cheese. We love their roasted veggie pizza and any of their soups that we've had. I love Amy's vegan bean burrito and chocolate cake. So yum! i love the vegetable pot pie and the roasted veggie pizza. all their stuff is fantastic! I love their lentil soup and chocolate cake! I love the dairy free burritos & the vegan mac and cheese the best. Because I sometimes miss my old omelette days, the Tofu Scramble curbs the craving. However, I am most thrilled that my meat-loving husband puts Amy's burritos on the top of his grocery list! Bean & Rice Burrito and refried beans are my favourite but living in Canada would love to see more options! I'm sad to say that I have never tried Amy's - we don't have many options here where I live. But I will have to look the next time I'm at the grocery to see just exactly what we do have. Would love to try some of what others have been commenting on! The Roasted Veggie pizza is to die for, even my meat eating family loves it! Also, the Alphabet soup is scrumptious, it reminds me of something from my childhood. I wish more Amy's products were available in Canada. Thanks for hosting this giveaway! I've only tried the roasted veggie pizza, but I love it - it lets me be part of pizza night again!! i love the texas veggie burger and the rice cheese pizza. I LOVE her new Dairy Free Burritos and have always loved her Indian Meals. I also love the fact that she named her company after her daughter. Seriously - could her products be any easier and any better? Love them. I live their vegan mac and cheese and their veggie loaf. I love the diary free burritos and the spicy chilis are my house favorites. Tough to choose! My favs are the black olive and mushroom pizza, and the delish lentil soup. Absolutely yummy! My top two favorites are definitely the "No Chicken" Chicken Noodle Soup and the Black Bean Enchilada dinner. I have tried to find an Enchilada sauce that tastes like theirs, and the only thing that has ever come close is Trader Joe's enchilada sauce which unfortunately has chicken fat and chicken skin in the ingredients :( Boo. But yay for Amy's products!! I really like Amy's soups. Hard to pick just one or two of them! I also like the Enchilada dinner. Do I have to pick just two? The roasted veggie pizza and the no chicken noodle soup are probably my faves, but I feel I must mention the vegan mac and cheese and the vegan enchiladas too. I love Amy's!! I love the California burgers and the meatloaf with mashed potatoes and green beans frozen meal. My husband adores the Indian frozen meals! I love the chocolate cakes, the burritos and the black eyed pea rice bowl! I am IN LOVE with Amy's Roasted Vegetable Pizza and also the Palak Paneer. Wow, hard to narrow it down to just two, but if I have to... I love the Thai Coconut Soup and the Tofu Scramble Pocket sandwich. LOVE! 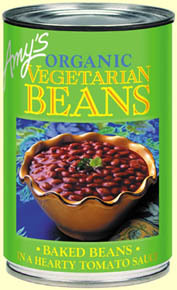 I love Amy's products; they are such a life-saver when I am feeling time crunched and need to make a quick, vegan meal. Also, I am pleased with the new gluten-free and soy-free products! My favorite products (although its hard to choose) would probably be the dairy-free, gluten-free, soy-free burrito and the new Sonoma burger! I also love their soups and marinara sauce! I love love love Amy's ROasted Veggie Pizza and the Tofu Scramble Meal. Yum! The Country Cheddar Bowl and The Vegatable Pot Pie! I also love the alphabet soup. Perfect with a Daiya grilled cheese sandwich. 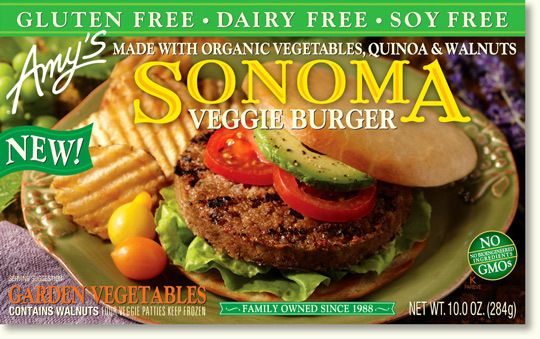 I also love the Sonoma veggie burgers. Amy's mushroom soupis very tasty and the California burgers are good. I love the california veggie burgers and all of the lasagnas! I love almost all of them, but my two favorites . . . I absolutely love the mac and cheese and tamale verde is my favorite.